Munsen Oasis is the most remote and difficult to access of the 6 oases in Joshua Tree National Park. 158 fan palm oases are in North America. 6 are in Joshua Tree National Park. 5 are on the map. January was a tedious month to say the least, tragic to say the truth. I lost one of my oldest friends and had to face the impending mortality of another very close family member. A mom has no time to grieve, she must wake up every day ready to emotionally support others. But even a mom has to have a full tank in order to fuel others. I needed a dose of the good medicine that comes from a physical challenge in the embrace of the strong, silent desert. My husband, excited to spend a weekend watching our sons play basketball and preparing for the Super Bowl, encouraged me to go smooth my feathers doing what I love. 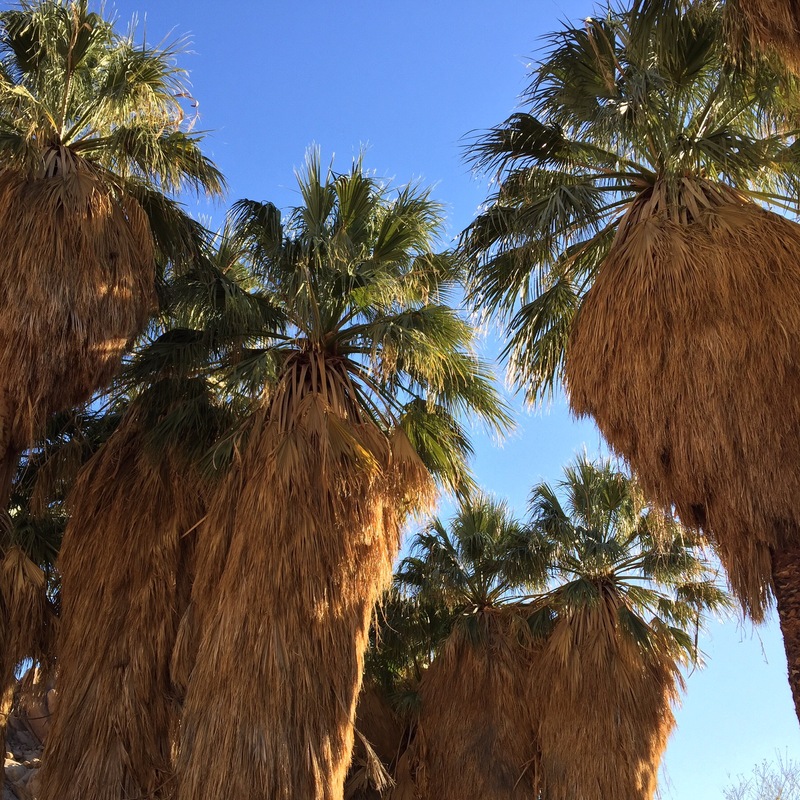 I invited my fit and adventurous friend Steve to accompany me on an excursion that I only had cursory information about from a couple of blog posts, a trek to the most remote and little known fan palm oasis in Joshua Tree National Park, Munsen Oasis. Loaded with my daypack strapped to my expedition pack. This was to be a backpacking trip in which we hiked up to the mouth of Munsen Canyon and set up base camp, then day hike to the oasis. Friday night we spent in the free dry camping area in Chiriaco Summit. Our front yard was a graveyard of WWII tanks parked behind the General George S. Patton Museum. I like things to get a little bit weird so this suited me just fine. Good beginning. Tank exhibit in front of our camping spot. We sat out a wind storm getting drunk on Budweiser and White Zinfandel (the only hooch on offer) and eating fried food in the cafe. By the time they said, “You don’t have to go home, but you can’t stay here,” the wind had died down and we were ready to cowboy camp on the desert. In the morning we fueled up with coffee at Chevron, then hit the trail. Since this trip was a pleasure cruise and not a cartography expedition, we were very loose goosy about how many miles we were actually putting in, but I estimate by our hiking time and eyeballing the gauge on the map that we hiked about 3.5 miles across the desert and up a wash before arriving at the mouth of Munsen Canyon where we set up camp on a high bench. Then the fun really started. Bouldering. A mile and a half of bouldering up canyon. Steve described it as “meticulous”. I think that’s a great description. It was nit picky work, constantly route finding and climbing over boulders and mega boulders, some the size of a bus. Talk about an adventure to clear the mind, there was nothing one could think about but the task at hand. It was both exhilarating and liberating. No slipping the brain into neutral and just walking. A blogger described Munsen Canyon as a “biblical trial”. It was. Thank goodness I brought along Action Figure Jesus strapped to my pack. He felt right at home in the desert and was a cheerful reminder not to take any of it too seriously. Action Figure Jesus “Millions of Followers” and “Real Gliding Action” So sayeth the packaging. We were exhausted and half-heartedly suggested giving up. (Not that either of us would have.) What spurred us on was the aspect of a few green shoots in the distance. Finally, we reached shangri-la, or at least the first two parts of it. Munsen Oasis is actually a series of several stands of Desert Fan Palms spaced along Munsen Canyon. The canyon is a well guarded secret of Joshua Tree National Park, because in this era of drought it is one of the only remaining waterholes for park wildlife that hasn’t been spoiled by tourism. Bighorn Sheep are one of the most sensitive species in the park and are very skittish about humans. If someone were to camp or make waste at a Bighorn Sheep waterhole, it is possible the sheep would abandon the spot, putting themselves at risk. We went into this expedition with the intention of making no impact on the water. As it turns out there was only a small amount of standing water at the first two of the possible eight pockets of fan palms in the canyon. By the time we reached the second oasis we knew we would not have time to traverse the whole canyon and return before dark so we resolved to eat and sleep on a big flat boulder in view of the oasis and hope to catch a glimpse of the elusive Bighorn Sheep. Hope springs eternal. Spilling ourselves out of the canyon was SO much more fun than climbing up it. We “flowed like water” over the boulders, sliding and dropping, enjoying gravity. It was so fun I was laughing out loud. Once back at camp I asked Steve, “Would you like some hot chocolate with vodka in it?” He replied as any sane person would, “Well, since you put it that way…” After dinner and cocktails we meandered up Lost Palms Canyon and in the dwindling sunlight contemplated maybe just taking an hour or so to try out how hard it would be to climb over the enormous dry fall that separated us from three more Desert Fan Palm oases that dot Lost Palms Canyon. 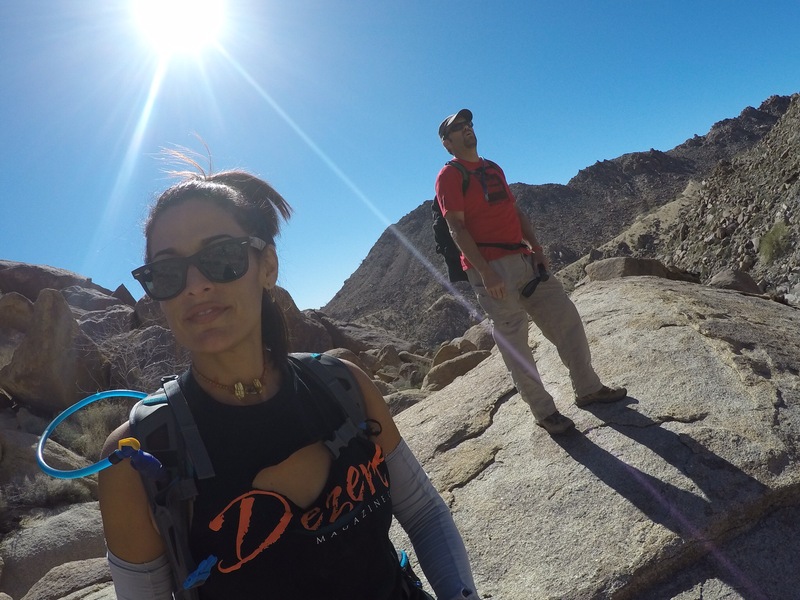 Good sense prevailed and we made a plan to hike Lost Palms Canyon another day. We cowboy camped under the stars and made light conversation in which we attempted to impress each other with information about things that we didn’t really know anything about at all. I was snug as a bug and asleep by 7:00pm. All day scrambling over boulders I kept pushing out of my mind the reality that rattlesnakes must be roosting under many of them. I told myself that I had nothing to worry about because it was winter and surely any self respecting snake would be cold and hibernating. Here’s a vista I was happy I didn’t see until Sunday morning on the hike out, snake tracks across the wash. Evidence of snakes looking for my sleeping bag. The desert is so clean and quiet. And Steve is so positive and peaceful. And the trail was so unforgiving yet rewarding. Before the drive home, as I dropped the weight of my pack from my shoulders, I resolved to drop my emotional burdens too and leave them in the sand. The desert held me for a while and reminded me how expansive life is and how simple life can be even while enduring trials. Just take it one boulder at a time and even better if you can have friendly people by your side. I am impressed with the two of you. Thanks for sharing this adventure !